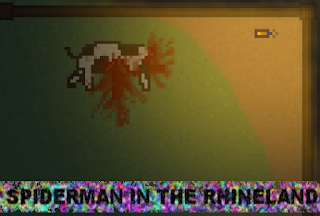 For those of you who read my previous post, I'm now working on a kind of joint project based on the podcast "Spiderman in the Rhineland", which I co-host(co-write?). So far, it looks pretty good. I've made a few pixel art assets and one background(which is going to get completely re-made), and my friend sent me some mock-ups of various rooms. I admit it isn't the best piece of material to get people to understand what this game is about, but nothing short of playing it or a hefty explanation from either myself or the aforementioned co-host will really suffice. However, I've been learning how to make some pretty cool looking shaders, namely this one which takes in a noise map and makes some pretty nice soft static/noise effects over the screen with it. Feel free to steal this if you aren't too specific about what you want in a shader and you also have a means to create or acquire a very colourful noisemap. 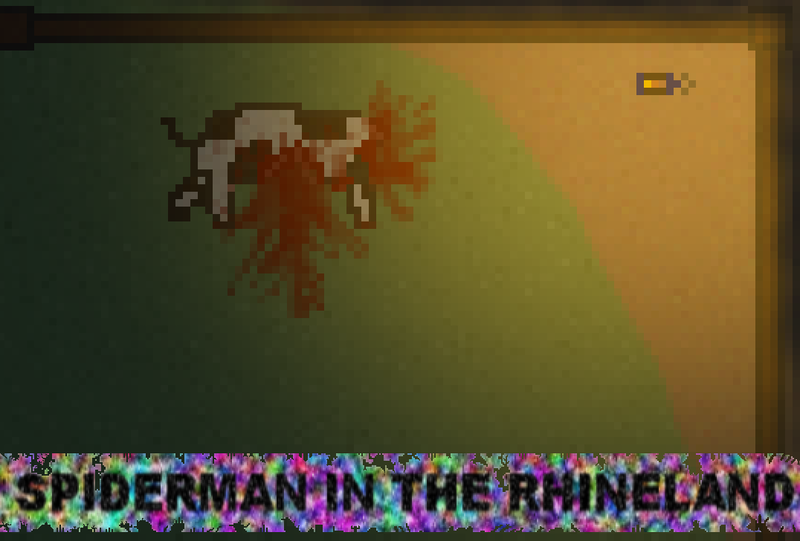 In fact, part of this noisemap is visible in the promotional material behind the big "SPIDERMAN IN THE RHINELAND" text. In fact, I stole the rand(vec2 co) function from Stack Overflow as a means of generating a random number, so you're extra encouraged to steal this, so I can feel less bad about stealing that. In any case, the real reason for the title of this post is because I spend 6 hours yesterday making a background which didn't even look that good when it was done. As previously stated, I'm going to have to scrap it entirely and remake it. However, that's pretty fine by me, albeit a little bit annoying. Unfortunately, getting too attached to single assets seems to be a large reason why I lose interest - I find myself getting very concerned about going back and losing the progress I have already made or wasting my time. Of course, it's a much bigger waste of time to shy away from the project entirely, but that seems to very skilfully subvert the "reasonable" sector of my brain. Anyway, if you have done, thanks for reading.